The chances of being hit by a chunk of space rock are measured in the billions-to-one. Roy Fausset, 59, had the closest of escapes last month when what scientists now say was a meteorite crashed through his New Orleans home. I walked through my front door and it was like a mortar bomb had fallen on my house. There was dust all over the floor of the entrance way and the two doors leading to a utility room and the powder room had been blown open. There was ceiling debris everywhere. I thought it must have been a broken pipe, but there was no water. As I was coming home, I'd noticed something on the roof, but had thought nothing of it. It turned out there was a hole the size of a basketball through the tiles. Whatever it was, it had passed through the attic, then my daughter's bedroom, through the powder room and into the crawl space under the floor. I thought it must have been some frozen waste that had fallen from a passenger airliner - they are carrying out improvements at our local airport, so planes have been diverted over our house. We really dodged the bullet. If anyone had been at home, they might have been killed. I took a sample over to the nearby Tulane University, where Stephen Nelson - the head of earth and environmental sciences department - examined it. He said the rock was rhyolite - which is found in Mexico and Texas. He thought it must have been thrown out of a plane by a vandal or become attached to a plane somehow and then fallen off. But now, after further analysis, it seems it has a profile consistent with that of a meteorite. The police investigator was right. I've collected up all the pieces. It's not a meteorite from Mars or Venus, which sell for $1,500 a gram. It probably came from an asteroid, so is only worth $3 - $10 a gram. It might help with the repairs. I keep asking: Why me? Maybe God was telling me something? But I don't care about the money. I'm just very grateful that no one was injured. We really dodged the bullet. If anyone had been at home, they might have been killed. I think just hearing the noise would have caused me to expire. One of my neighbours was out in her yard with her children eating popsicles. They heard the impact and thought it was a car accident. If it had fallen 100 feet away, they could all have died. I've been very disorientated by the whole thing, especially when I consider what a narrow escape we all had and what could have happened. I keep asking: Why me? Maybe God was telling me something? I certainly went to church on Sunday and I will never mock Him as I did in my foolish youth. We had a meteor sizzle through the air and land in a swamp nearby, years ago. Never thought it was a message from beyond though! Just a reminder that it's a messy solar system.I've been told by a scientist that very tiny meteorites are constantly falling virtually everywhere on this planet.They accumulate on roofs and wash down through rain gutters and downspouts.You can try to find them by removing the soil under the downspouts and running a good magnet over it. About 14 years ago my children were playing in the garden here in rural Leicestershire, UK. One of them came in and said there was blue ice in a hole in the grass. It was a baking hot day and, as the children were quite young, I went out thinking that I would quickly be dispelling this idea. But they were right ...a large chunk of blue ice, about a cubic foot was embedded in the grass to a depth of 10-12 inches in the summer-hardened earth. We supposed that it had fallen from a plane and although there were denials from our local airport, we suspected that somehow it was disinfectant from lavatories that made it so very bright blue. Clearly, the object would have killed a child and we counted ourselves more than lucky that everyone was OK. Planes still pass overhead all the time as they approach to land near Loughborough and I often wonder about the risk of a recurrence. One thing is for sure though, however low the probability, you don't have to wait for meteorites for a headache that could ruin your day. The chances of any one of us being hit by a meteorite may be billions to one, but there are billions of humans now - so the chances of someone somewhere (or rather, someone's house somewhere) getting hit by a metiorite are not nearly as high. 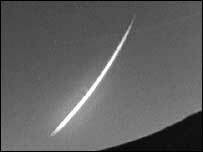 The earth's atmosphere is constantly bombarded with meteorites, most of them thankfully small, but some do reach the ground. Chance in a billion of hitting him or hitting his house and going straight though? The odds are there but there's no need to be paranoid about it.